The major earthquake that struck the Pacific Coast of East Japan on March 11, 2011 claimed the lives of over 15,000 people and destroyed or partially damaged many buildings. More than 90% of the fatalities and most of the structural damage, however, were caused by the massive tsunami that followed. 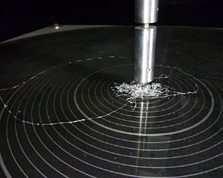 Devastation as a result of the earthquake itself was surprisingly limited considering its magnitude of 9.0 on the Richter scale, due to an array of technologies developed in response to natural disasters. Take the trains, for example. 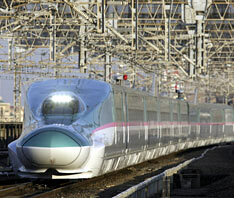 In Fukushima, Miyagi, and Iwate Prefectures, which were struck hardest by the quake, five Shinkansen trains operating at 270km/hour did not derail; in fact, all were able to come safely to an emergency stop. 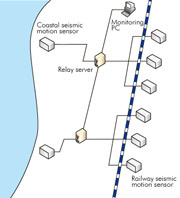 The UrEDAS system — which detects an earthquake’s small seismic waves prior to the arrival of larger waves and automatically cuts the power to bring trains to a stop — functioned perfectly. Earthquake-Resistant Construction Standards Updated 30 Years AgoSendai, the largest city of Miyagi Prefecture and the Tohoku region, was hit by strong tremors measuring over intensity six on the Japan Meteorological Agency (JMA) seismic intensity scale. Although many roofing tiles of old houses were dislodged, very few buildings actually toppled or collapsed. The low instances of severe structural damage may be due to the fact that most modern buildings have been built to meet the New Earthquake-Resistant Construction Standards, which were revised in 1981. They were devised to ensure that structures are able to withstand earthquakes measuring up to intensity seven, the highest reading on the JMA scale. Thus, structures equipped with thicker beams, posts, as well as more braces and rebar that were previously required managed to survive the massive quake. 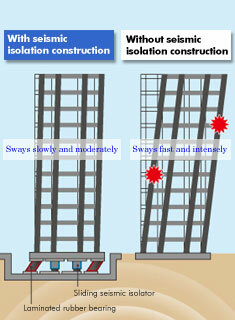 Apple Towers Sendai (photo: APA Group) proved the effectiveness of seismic isolation construction (illustration). From Earthquake Resistance to Seismic IsolationEarthquake damage is not limited to collapsing buildings. Tremblors measuring six or more in intensity can send furniture and large interior fixtures falling or flying, crushing people in their path. The threat increases dramatically with height: the higher the floor, the stronger it shakes during a quake, leading to increasingly severe damage in rooms. To mitigate this danger, the construction industry has for the past 15 years been researching “seismic isolation” technologies, whereby structures are decoupled from the base foundation, so that the buildings themselves are not affected by ground tremors. 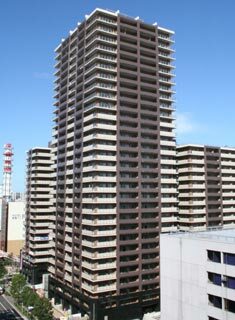 Such construction methods proved to be particularly effective for high-rise buildings during the recent earthquake. The laminated rubber bearing (left) and sliding seismic isolator (right) are key structural elements to seismic isolation construction. 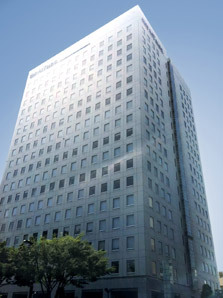 Sendai MT Building remained undamaged during the Great East Japan Earthquake. One of the key features of seismic isolation construction is the use of two types of massive bearings that support the entire building. The first of these is a laminated rubber bearing, made of alternating layers of rubber and steel plate, which sways left and right to isolate the building from the ground tremors. Then, as the shaking intensifies, the sliding seismic isolator, a laminated rubber bearing with a sliding mechanism achieved by attaching resins that slide smoothly to the bearing, works to absorb strong tremors. These seismic isolation technologies theoretically cut the intensity of shaking on the building’s top floors to one-third of the seismic intensity on the ground, and also substantially slows the swaying itself. This in turn prevents damage to the building’s framework and keeps large furniture inside from toppling. According to data on structural displacement relative to the ground, the aforementioned two buildings recorded a maximum horizontal displacement of 14cm and 23cm, respectively. Thanks to seismic isolation techniques, the two buildings were to a great extent spared the intense force of the March event.